It’s coming out of the ground!!! Time to catch up…phewwww, it’s been a crazy ride here in San Pedro, Belize! After the cistern floor finished – literally, the NEXT DAY, the guys started moving and setting blocks onto the floor, along the walls over the top of the rebar that was left sticking up all along the edges – about 4 feet high. After 3 rows, a 5/8″ rebar belt went in, and the block cavities were filled – then another 3 rows of block with the rebar extended. Again, we filled the cavities of the blocks. They then poured the columns – co rners at 45 degrees – tying the whole structure together. This gives us a solid concrete wall with steel re-bar reinforcing the whole thing. A fter that, the plaster coat went on – fascinating way to coat the walls. First a thin layer, then 2 thicker layers. This will be finished off with a thin final coat of ultra strong concrete designed to water proof the tank (although we will be coating it with a potable water membrane as well). The guys then constructed 45 degree angles around the bottom – like what you would find in a swimming pool. It comes straight out of a wheel-barrow on a trowel and is flung at the wall using an upward motion and flick of the wrist. Horribly repetitive process, but MY guys are STUDS – had it done in under 2 days! While this was going on, Victor (Pinky) was tying the cages for the beams that would become the first floor. 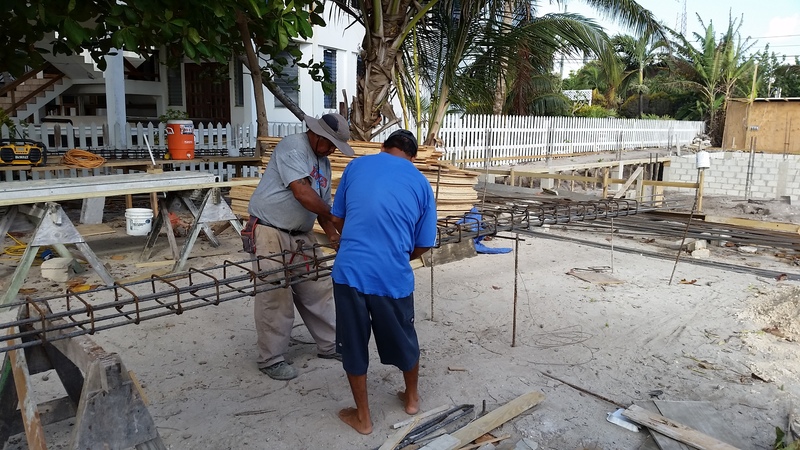 Rigo and Patch worked with a crew each, and started framing in forms for the beams and floor. This is an amazing feat in my opinion. First the platforms for the beams go in, then the walls of the beams, then finally, the plywood to support the floor. All of this is held in place by bush-sticks (rough hardwood that comes in 12 foot lengths and is cut to the exact size needed). I’m talking 500 bush-sticks!! (more pics to follow). You can see some on the right under the beam platforms. Imagine the entire area covered with plywood supported by bush-sticks. Once this is done, the plumber and electrician come in and install conduits for electrical outlets, water supply lines for sinks and commodes, hot water supply lines, drains for sinks, showers and commodes, air-conditioner lines and drains, hose-bibs, laundry supply and drain lines, gutter drains that will go all the way to the roof of the structure to fill the cistern, over-flows for the cistern as well as air-traps in the cistern (so that it won’t over-fill and push up the structure due to trapped air, and – you get the picture! Juan Diaz (nickname “John Day”) is THE plumber/electrician on the island. Trust me on this one. After spending an hour looking over the plans, he picked up on about 10 things that I missed. He’s made at least that many more suggestions and I have agreed to every one!! He’s at the top of his game and has done a lot of projects here. When he says, “did you think of having this here” or “that there”, I don’t even have to think about it – I just tell him, “go for it!”. He made several suggestions on the pool which I hope everyone will appreciate as much as I will – more on that later! This is a rare picture of Juan because he’s always flashing a great smile! You might be saying, “whoa, back up a minute, the first floor looks like it’s already poured in that last picture…..what the?” And you’d be right. As fortune would have it, we had planned on returning to the US for a family wedding on May 30th – never guessing that construction would have moved along so quickly. 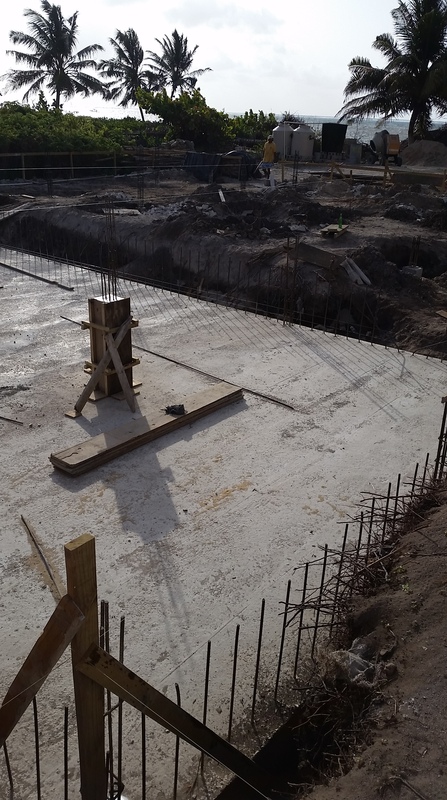 So three days after we left for Erie, Pa – the first floor was poured! (inside and out), smart, caring, great dancing, all-around great person and niece Lindsay (Egg) Kopac and her very cool, out-door loving, water-fowling (5 gold stars! ), equally great person and now new hubby, Chris! She is a STUNNING bride!!! Here’s a really cool photo of Father and Daughter looking calm and cool before walking down the isle together! (sorry, I got distracted!!) Here’s another pic of the first floor slab – courtesy of my main man on the scene back in San Pedro – Brian “Mac” McCarron. Brian was our eye’s and ear’s on the ground and the main reason we were able to sleep while back in the U.S.! floor of the cistern, within 24 hours of the floor being poured, block walls were going up on the first floor. Omar’s crew wasting no time and getting right down to it! 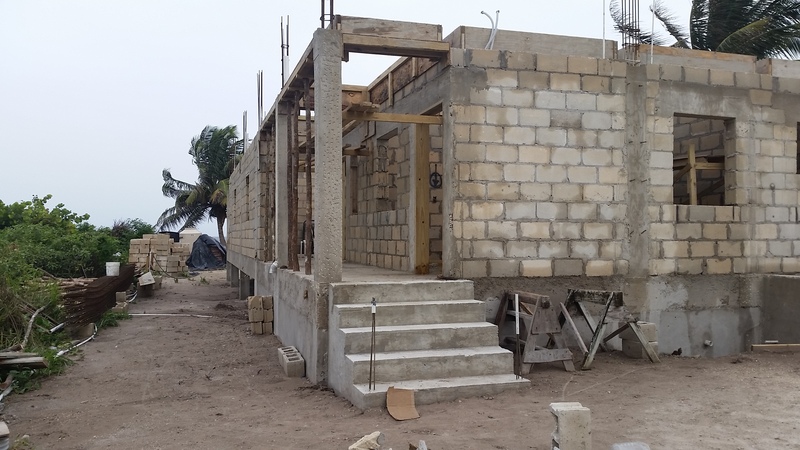 The block walls go up quickly, leaving room for the next row of columns, window and door lintels (the top of each doorway and window is poured to be able to hit the exact height of each and to tie them all into the rest of the structures.) 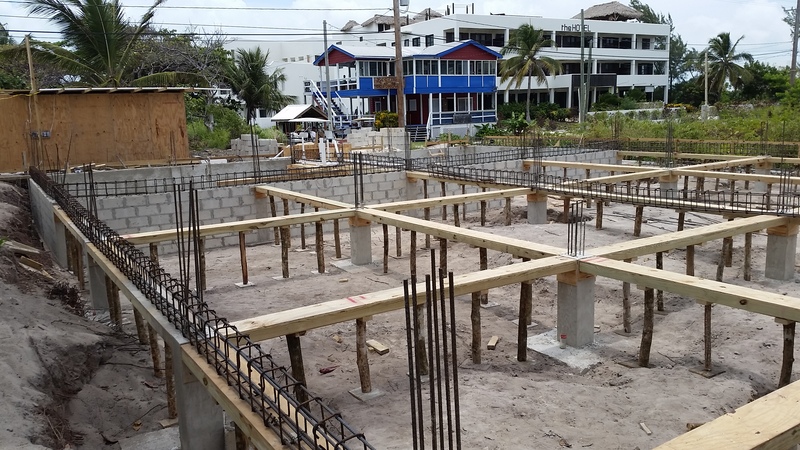 The plumbing and electrical sticks out of the 1st floor slab at odd places, but when the interior walls go up, we finally see how the layout of each room is going to look. We can now see each bathroom, bedroom, kitchen, etc and what it will look like when finished. We’re really getting excited now, seeing our vision take on form!!! We have a plumber and electrician on the job every day now. 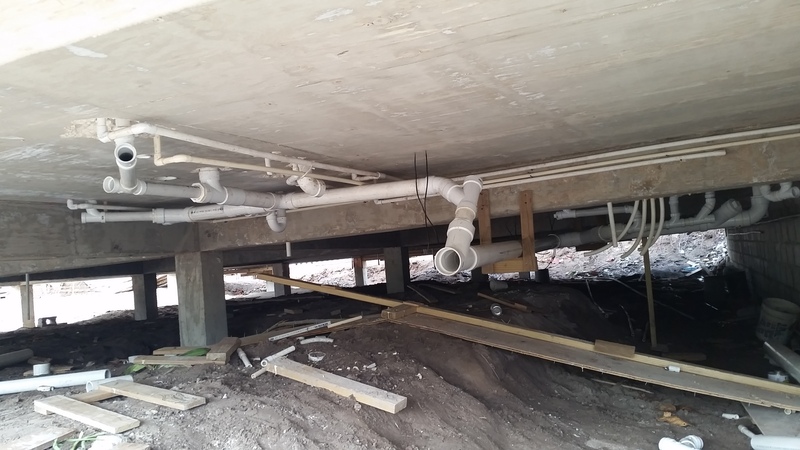 They are working under the first floor connecting drains, sewer lines, supply lines and setting up the laundry room and air conditioning. Also, they are getting ready for the 2nd floor since EVERYTHING has to be in place, before the next floor is poured. Each outlet for gas, electricity and water has to be set exactly or it won’t line up with where we need it for the 2nd floor. While the walls go up, we have men forming rings and tying steel for the beams and columns that will become the 2nd floor. Other guys are forming the window and door lintels. 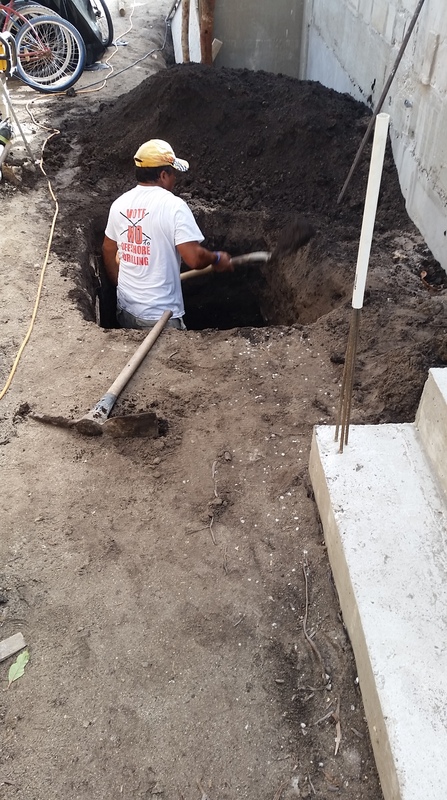 As before, each day ends with an “all hands on deck” call to pour that days lintels. The blocks on either side of the lintels are also cavity filled for added strength. A crew starts stripping the forms from under the first floor at the same time a separate crew start forming up the 2nd floor beams – just like the first floor. First installing the ramps that will carry the beams, then installing the support for the plywood that will hold the cement for the 2nd floor. It’s more labor intensive now, since there are additional interior walls that need to be formed as well AND guys are working 10 feet over the 1st floor. The back stairway is also beginning to take shape. It will be poured at the same time as the 1st floor and beams, so that it becomes an integrated part of the complete structure. Our last piling goes into the ground and a piling cap is poured to insure the stairway stays put. Rigo draws the short straw and starts digging. Then the forms and stee l for the stairs begin – Erwin is the master of stairways and completes the project in under 2 days. The guy can WORK!!! By the way, this is a fraction of the steel in the stairway. There is a grid of 1/2″ rebar up and down the stairway as well as starter bars for the upcoming hand-rails. There’s also electrical outlets and 2 light fixtures under these stairs – installed by none other than John Day – Juan Dias! It seems like minutes – but it’s really days later – and the men are ready to install the 2nd floor plywood and steel. After that, it’s Juan Diaz, Vladamir and Eddy for a few days of plumbing and electrical and we’ll be ready to CAST THE 2ND FLOOR!! On a closing note, it bears mentioning that Omar’s crew are trained to salvage every bit of lumber and plywood. When they stripped the forms from the first floor pour, they carefully removed every nail and stacked the lumber and plywood neatly – making sure it was covered with plastic. Smaller pieces are piled up to use later, instead of cutting up a brand new 2X4, they go to the pile and get what they need. This is a HUGE budget saver. It would cost a small fortune to have to purchase all this again as building supplies on an island are expensive and scarce. Each night before we leave, the guys tidy up the job-site, covering cement and wood, putting up tools used that day, picking up garbage, etc. Everything has it’s place in the bodega to be dragged out again tomorrow. Thanks again for following our project. Be sure to follow us by entering your email so that you’ll get notifications when new posts go up. Thanks also for your support and positive feedback – we love hearing from you! Awesome, awesome, awesome! That us a fantastic crew you hired so your homework paid off! Hope you and Laura are doing great. Did you get moved? Wow!!! Very impressive and exciting!! Thanks, Tim. It’s moving right on schedule (amazingly and knocking on wood!!!) 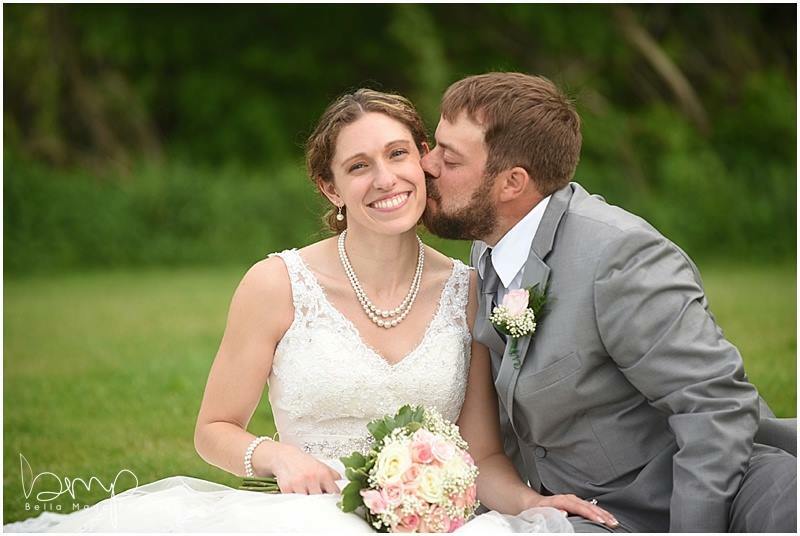 Hope all is great with you and Laura! Great pic of you and her in front of your house! !